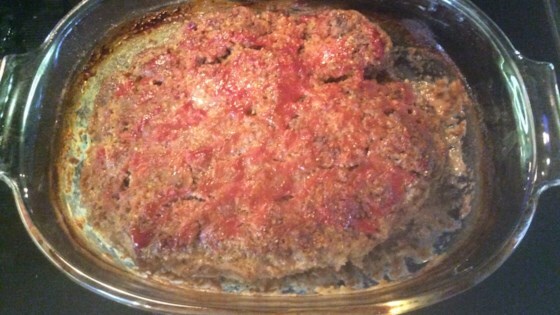 "A gluten-free, kid-friendly, and easy meatloaf." Stir milk, grits, egg, cocktail sauce, 3 tablespoons ketchup, onion powder, salt, and black pepper together in a large bowl; add ground beef, mix with your hands until the texture is consistent, shape into a loaf, and put into a loaf pan. Spread 1/4 cup ketchup over the meat mixture. This incredibly moist, tender meatloaf is based on Italian meatball technology. If you are strict about gluten-free, make sure your cocktail sauce and ketchup have no gluten-containing ingredients. You could also make this with ground turkey instead of beef. Tastes great! I made it with 2 pounds so added some of the listed ingredients, but it has good flavor! Used 2 pounds Italian ground turkey, 2 eggs and left out the milk. My son and husband had seconds! The recipe was very easy to make. I am a fairly new to cooking. I am currently taking culinary classes at a local school. I am excited.